Yamaha's newest addition to their Recording Custom Metal Snare lineup combines the classic cut of brass with Yamaha's drum manufacturing prowess. Also available in 6.5x14 and 5.5x14 versions. The Yamaha Recording Custom has a rich legacy in modern drums that is decades long. As one of the most recorded sets in history, Yamaha sought to create a formidable snare drum to complement the iconic drums. The Yamaha Recording Custom brass snare drum brings the classic brass snare drum sound with the quality of build that you've come to expect with the line. The thin welded shell produces crisp and articulate notes that annunciate from the subtlest of dynamics to the most forceful pummeling. The Dyna Hoops added enough strength and weight to provide great side-sticking and rimshots without taking away sustain. The new one-piece lug design also aids in the tuning ease and feels smooth with each turn. Yamaha's Q-Type throw-off is a solid and robust piece that is quiet, efficient, and rounds out the package. 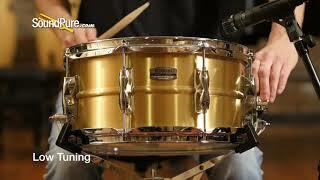 The Yamaha Recording Custom Brass snare drum is available in three different sizes to help you find your ideal sound. If you find yourself wanting that classic brass snare drum sound, the Recording Custom Brass snare is well worth the consideration. In this video, Sound Pure percussion specialist Barry Knain explains the various features of the Yamaha 6.5x13 Recording Custom Brass Snare Drum, and tests it out in several different tuning ranges.